The Coveo connector requires direct access to the Oracle UCM Content Server to be able to crawl its content. You must ensure that Oracle UCM is allowing traffic from the IP address of the Coveo server. Log in to your Oracle UCM Content Server using an account with full access privileges. 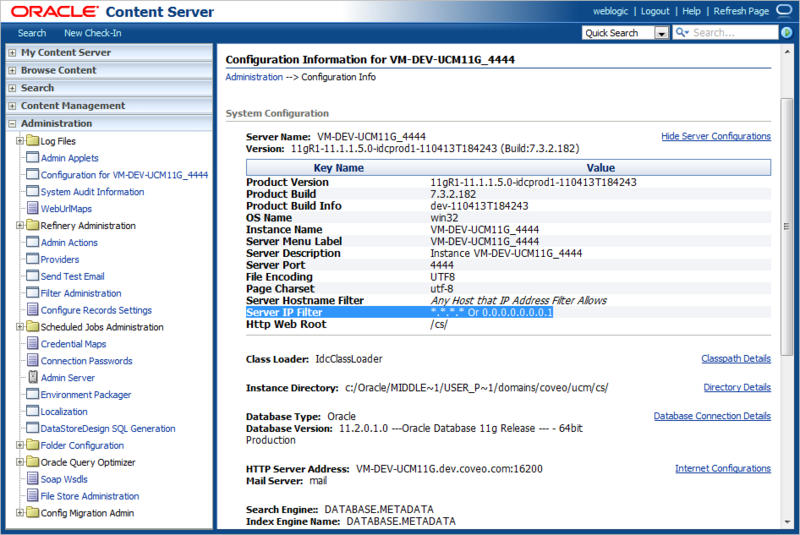 In the navigation panel on the left, in the Administration section click Configuration for [Your_Oracle_UCM_instance]. 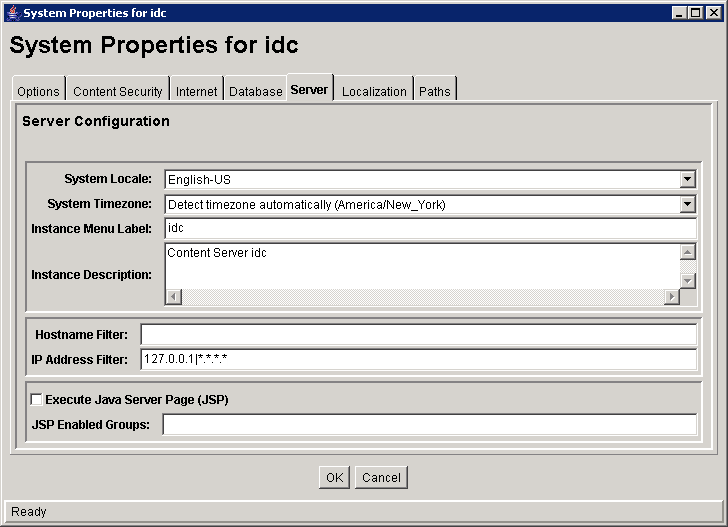 In the panel on the right, under System Configuration, click Server Configuration to expand the server configuration information. Verify that the Server IP Filter key name contains either *.*.*. * or the IP address of the Coveo Master server. If it is not the case, use one of the following procedures to modify this parameter. Using an administrator account, connect to the Oracle UCM server. On the Windows Start menu, select All Programs > Oracle Content Server > [idc] > Utilities > System Properties, where [idc] is the name of your Oracle UCM instance. In IP Address Filter, either add *.*.*. * to allow connections to the Oracle UCM server from any IP addresses or add the specific IP address of the Coveo Master server. Edit the SocketHostAddressSecurityFilter parameter to either include *.*.*. * to allow connections to the Oracle UCM server from any IP addresses or include the specific IP address of the Coveo Master server. Create a dedicated crawling account (see Creating an Oracle UCM Crawling Account).